Football season is the perfect times to make a football cake for your football fans. 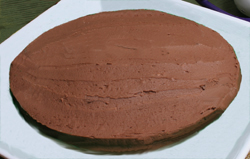 It is easy to create and decorate this cake by starting with a round cake. All that is needed is a round cake, chocolate frosting, and a little white frosting. 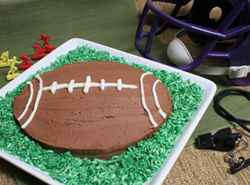 This football cake is perfect for a birthday or a championship victory celebration. It would also make a great dessert for a Super Bowl or tailgating party. The recipe below calls for a regular cake which makes two layers. You only need one layer to make the cake but if you are serving a groups you could always decorate both layers for two cakes or layer the cake for one two-layer cake. You can make the cake the easy way with a cake mix or use your favorite homemade cake recipe. The recipe suggests using canned frosting but you can make homemade frosting also. Just be sure it is fairly firm so it will hold its shape. You do not want to use a light and fluffy frosting for decorating this football cake. Mix the cake according to instructions. Pour into two greased 9 or 10-inch round cake pans. Bake as indicated on package (or recipe). Remove from oven and allow to cool for 10 minutes and then remove from pans. Allow the cake to cool completely. For better decorating results, after the cake has cooled, wrap the layers and place in the freezer overnight. Remove from the freezer before decorating to allow them to thaw. If layers are slightly domed on top, do not worry about leveling them. The domed top will give the ball a rounded appearance. Cut out two inches all the way across from the center of each of the layers. After removing the center two inch strip you should have two half moon-shaped sections for each layer. Place the cake on the cake board or plate that you want the finished cake to be on, place the first half moon-shaped section. Spread a little coating of frosting on the cut edge. Place the other half moon-shaped section next to the first, butting the cut sides together. The layer of frosting will help hold them together. This should form the oblong football shape for the cake. Add wax paper around the bottom to protect the surface while decorating. If desired, you could layer the cakes to make one double layer football cake but then you would want to level the bottom layer before placing the top layer on it. Add a layer of frosting and then place the two half moon-shaped sections together on top of the first layer, domed side up. Line up the edges as evenly as possible. Be sure to spread a little frosting between the two sections to help hold them together. The cake is now ready to decorate. Frost the sides of the cake and then frost the top with the chocolate frosting. Smooth out the top and sides as much as possible before adding the lacing. Place the vanilla frosting in a pastry bag. If you don't have a pastry bag, place the frosting in a small sealable plastic bag and clip a small opening in one corner. Squeeze out the vanilla frosting to decorate the cake with the lacings in the middle and trim lines at each end. If you placed wax paper around the bottom of the cake to protect the cake plate while decorating, it should be removed now. Then place the coconut in a bowl and add approximately 5 drops of green food coloring. Stir the food coloring into the coconut until it is evenly colored. If necessary add more coloring to achieve the color you want. 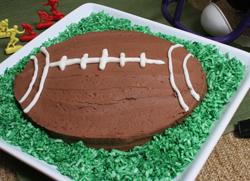 Sprinkle the colored coconut around the football cake to resemble grass. The cake is then ready to serve at your special celebration.